We left Livigno pleased with ourselves for having survived the cold and happy that we’d managed to get some skiing in. During the cold nights we had discussed what we would do next and concluded that we wanted to spend more time in Italy. The plan was to drive down to the south and experience the toe, heel and instep of Italy before heading back north, taking in some of the central Apennine mountain areas we hadn’t been able to visit in Feb. Finally we would top off our mainland Europe trip with some time in the alps before returning back to the UK in late June. Perhaps we would get some more skiing in during this time, but we felt we had a few modifications to make to our set up before taking an extended skiing trip. Next year we will be trying for 4 to 6 weeks of skiing but under a tighter budget and with (hopefully) a better heating set up. We left Livigno in a good weather window that allowed us to re-cross the Foscagno pass and headed back to Sondrio where we plugged into the free electric and made use of the laundry facilities, again. The snow started to fall in earnest as we settled in for the evening in Sondrio and the forecast was for significant snow fall over the next 24 hours. We decided we would head back towards the Adriatic coast, taking toll roads, and see how far we could get. We made it to Rimini, slowly, but there seemed little point in stopping to sight see in this weather. 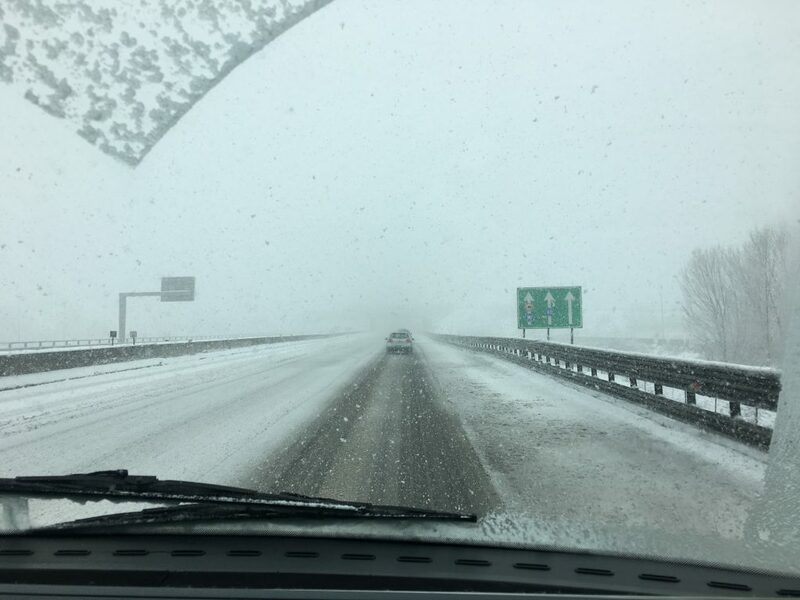 The roads got gradually more and more snowy, until at one point the three lane autostrada had only one lane that was drivable. We wondered if we would end up having to stop at the motorway services overnight, there were many lorries in the service areas sitting out the weather and some taking shelter on the hard shoulder under the bridges. 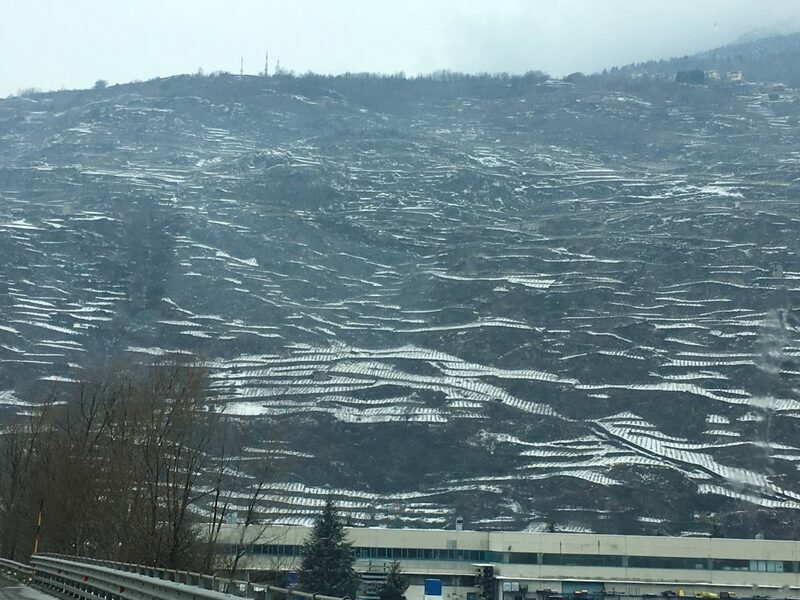 For one stretch of the autostrada vehicles over 7.5 tonnes were asked to leave the road until the snowploughs had gone through. But once they mobilised the snow ploughs and gritters it was a marvel. Anyone who says that Italians are disorganised and undisciplined should watch the spectacle as the snow clearance vehicles line up for each section of the road. Entering at one junction they move in formation down the road to the next exit where a new group has jurisdiction. Yes, we had to travel slowly behind them a couple of times, but the roads were beautifully clear once they had been through. Finally we made it to Rimini where we parked up for the night, there was still snow down here on the coast, but fortunately it was warmer. Our carpark was quiet overnight but in the morning it was absolutely heaving. From our bed we could hear cars arriving and leaving, but it was a Sunday, what was going on? When we finally emerged from our Bertie bubble we realised that it was election day and the school next door was a polling station. We mulled over the practicality of holding an election on a Sunday, so much less disruption than the UK’s Thursday with the associated school closures and childcare issues. But the Italians make up for this practicality by having one of the most complex electoral systems. I’m still not entirely clear on the result – it was a hung parliament and I’m not going to get to grips with Italian politics enough to understand what alliances are being made – except that that the worrying popularity of anti immigration and isolationist policies is in evidence. Despite being unable to run for office, Silvio Berlusconi’s face is on posters everywhere, still a popular figure and backing the centre right alliance which just about won the most seats. From Rimini we took the autostrada south, finally getting past the last of the snow as we got south of Abruzzo. We stopped for the night in Termoli, our second visit here. This time we parked along the newly renovated seafront which had a good cycle path in the same soft jade green as the sea. As it was the low season there was no charge and the long sea front had barely any visitors. The weather was a bit drizzly so we stayed in a watched the sea from the comfort of Bertie. Two long days of driving had done us in and we were ready to slow down.